While hunting for sources of Beatles songs for the ukulele, I came across the above mission statement from The Beatles Complete on Ukulele. These folks set forth on the admirable enterprise of recording the complete collection of Beatles songs with ukulele accompaniment. It only took them about 3 1/2 years, which is fairly awe inspiring to those of us with less ambitious, though yet to be reached goals. But what really impressed me about this crew is that they took a mission statement (with which most every player of this lovely little instrument would agree) and put it into action. 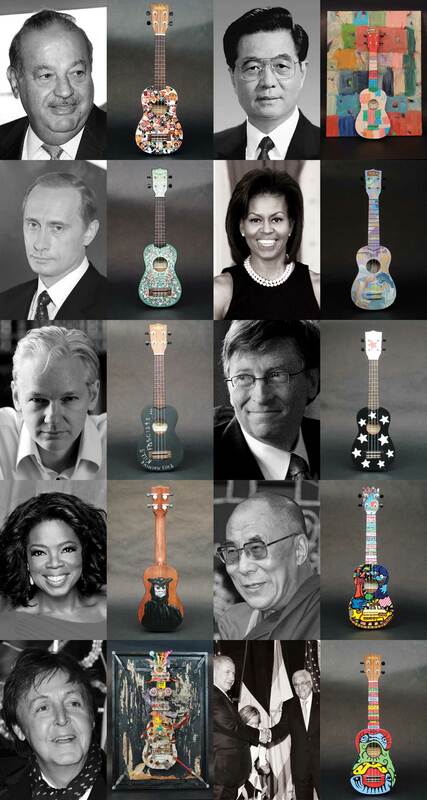 In the midst of recording the Beatles songs, they did a little “Performance Philanthropy” project called “10 ukuleles” They recruited 10 of the leading artists in NYC to each decorate a Kala ukulele, and then awarded those ukuleles to: ” The 10 Most Important People In The World”. A second set of 10 was auctioned off for charity. Dang! I love ukulele enthusiasts. What will we think of next? This entry was posted in Uncategorized and tagged art, Beatles, charity, philanthropy, TBCOU, The Beatles Complete on Ukulele, ukulele. Bookmark the permalink. Sherri Campbell on Up and running again!